See scan - perfect condition. This is a nice and rare vintage sterling silver Scottish Terrier / SCOTTIE pin brooch paved with semi precious stones and with scarce master work. The brooch measures 33m x 28mm. 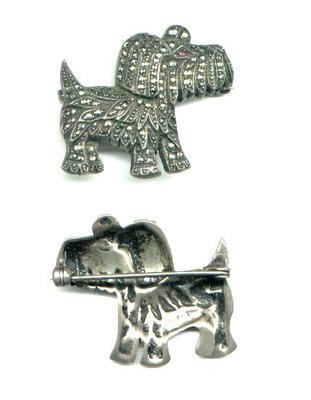 Scarce dogs scottish terrier collector piece and one of the rare Scottie brooches / pins.